Havana is a very interesting place. I can’t do it justice in a few words, but if you’re interested in reading about Cuba and the current political situation, I highly recommend the November 2012 issue of National Geographic that has a very well-balanced and informative article on Cuba. 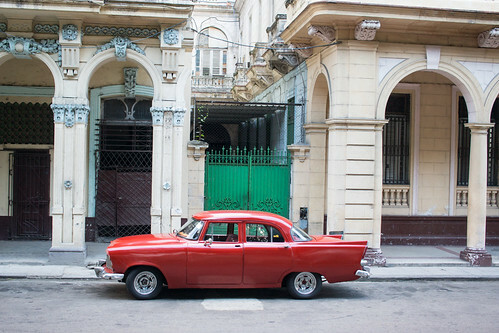 You can also check out the NG guide to Cuba. Trish and I recently went to Havana for a week-end. We flew down on points and stayed at a ridiculously luxurious 5 star hotel, the Iberostar Parque Central. This hotel is reasonably priced for this type of thing and is positioned in a beautiful spot across from a lovely park and just at the border of the old part of Havana. It is perfectly placed for a nice stroll down to the Malacon, the sea-front boulevard of Havana, or a nice walk into the old town where you can have a nice meal, drink a Mojito, see a band play or visit one of the many lovely museums. And, best of all, when you are finished rubbing shoulders with all the other tourists and the buskers and the guides, you can take refuge in this air conditioned oasis of a hotel where it is peaceful and quiet. However, this is not what this blog is about. This blog is about cars. Old cars. Cars that were built before 1959. 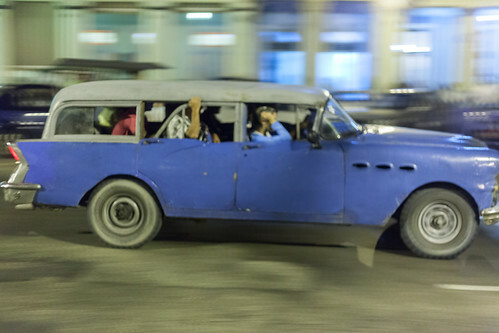 Anyone with a passion for old cars knows that Cuba has more than its fair share of these lovely beasts. 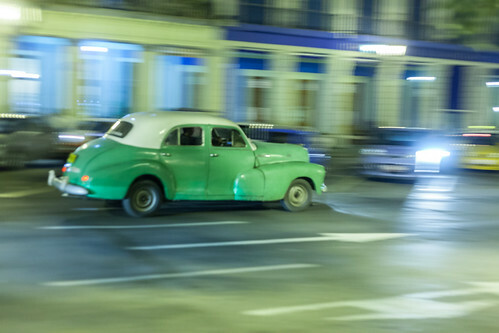 After the Cuban revolution, there was a long hiatus where the only cars that made it into the country were crappy Russian Ladas. 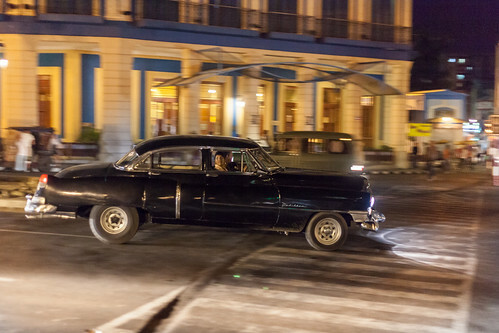 Even these were exorbitantly expensive, so the Cubans kept their old American cars and took loving care of them. As they aged, many of the owners bought up rusty old Ladas and put their four cylinder powerplants into the American cars to keep them going. But, the outsides remain faithful to the originals. 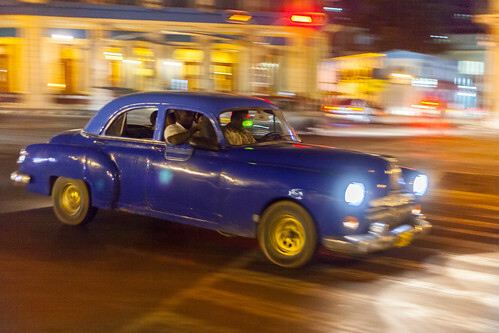 New cars are starting to arrive in Havana. I saw lots of Kias and Hyundais as well as the odd Mercedes and Audis. 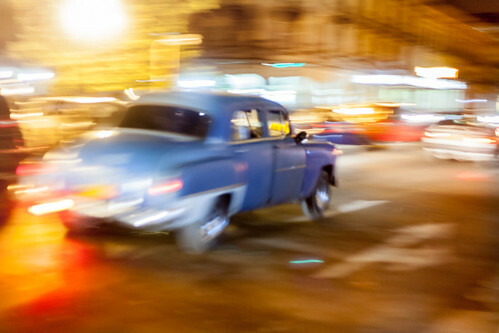 The days of the old Americano cars are numbered. If you want to see these oldsters, don’t wait. Go now. 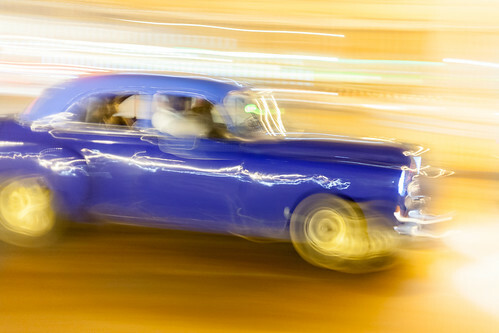 I’ve seen lots of pictures on the interwebby thing showing old Cuban cars. 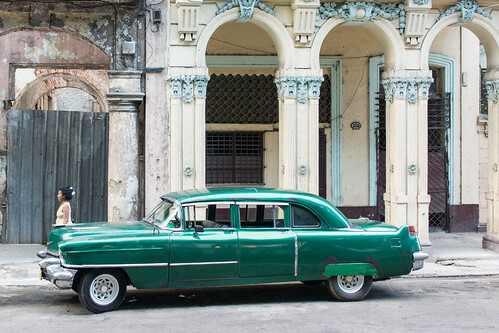 Most of them show cars posed lovingly in front of the decaying buildings of old Havana. I took some of those too. The cars are sitting ducks. 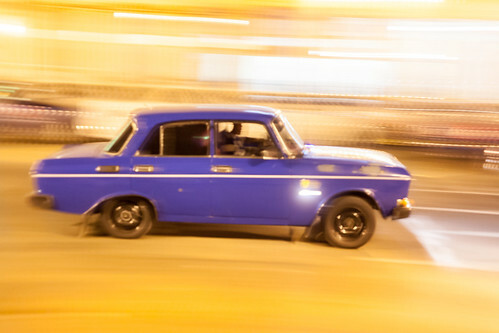 I wanted to try something different, so I hung out on the main drag on a Saturday night and took pictures of the old jalopies doing the circuit around Parque Central. This seems to be the pastime of many young Cubans. Many cars came around for a second or third time. I learned how to pan my camera to blur the background and show just enough motion so that the cars’ kinetic energy is highlighted. Here are some of the better shots. I hope you enjoy.